Keep reading. This is not spooky, it’s a celebration of life. 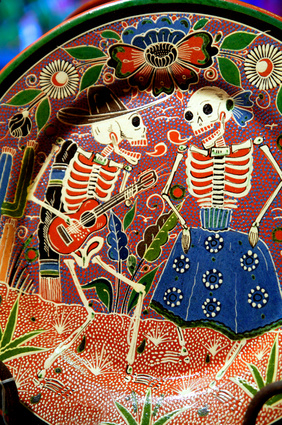 I have a huge “Day of the Dead” collection, which includes pottery, dishes, carved wooden boxes, ornaments, dancing skeletons and an assortment of other oddities. Add that to my cactus obsession, mountain lodge look, ski memorabilia, antique furniture, massive book collection and you have an interesting, albeit a bit strange, decorating theme. Dia de los Muertos (Day of the Dead) is a Mexican spiritual celebration connecting souls of the living and dead. Unlike our Halloween celebration, Dia de los Muertos is observed on November 1st (all saints day) and November 2nd (all souls day) and is a tribute to departed loved ones. Celebrated in Mexico, Central America and certain parts of the U.S. southwest, it’s a ritualistic way in which people honor the dead by decorating gravesites with flowers, candles, toys, food and even tequila. They celebrate, eat, drink, party and converse with their loved ones. Others set up similar festive alters in their homes and play music and cook the favorite foods of the deceased. It’s interesting how celebrations of all kinds revolve around food, even celebrations for those who are only here in spirit. I love that! Rather than attempt making sugar skulls (no thanks), which is a typical Dia de los Muertos treat, I’ll leave you with one of my favorite recipe offerings. * This is a guideline, you might want to add a little fresh lime juice, some chopped cilantro, diced tomatoes, a pinch of brown sugar or a teaspoon of agave. I have also added about a half a can of Eden Organic Pizza/Pasta sauce before and it was wonderful in the mix. 1. Heat the olive oil in a medium-sized soup pot. Sauté the onion for about 5 minutes and then add the garlic. Continue cooking for another minute or two. 2. Add the broth and water to the pot and reduce heat to low. If using, add the pizza/pasta sauce. Stir well to blend liquids. 3. Add potatoes, green chiles and chile powder. 4. Simmer for about 45 minutes to an hour, until potatoes are tender. Add beans, corn and other seasonings. Heat and serve topped with shredded cheese and diced avocado. Go forth, celebrate with good food and share it with your loved ones! This entry was posted on Saturday, October 31st, 2009 at 3:47 am	and is filed under Miscellaneous. You can follow any responses to this entry through the RSS 2.0 feed. You can leave a response, or trackback from your own site. I think Dia de los Muertos is one of the more intriguing holidays. Yummy soup! Recipe looks great, thanks. I just learned about this celebration in Spanish class very timely and interesting. This sounds just the thing on a cold, wet autumn day… I love home made soups and nearly all mine end up with a little grated cheese on top regardless. What with your collection of the weird and wonderful and mine, customers waiting to be seated at our hugely popular soup kitchen will certainly never be bored! p.s. Fernandez medium hot sounds like an old flame Melissa, he wasn’t a flamenco dancer by any chance? Very timely post. Have been out to get fresh flowers this morning and am gathering my photos of those I’ve lost to make a shrine. A few friends are coming around this afternoon with tokens of their losses – to drink, eat and celebrate both life and death. Sounds like my kind of soup..I’m intrigued by the chilli powder and the different grades you get in the US. Pinto beans are great in anything aren’t they?! Soup? I am here I made 4 different soups last week alone (for our Soup Kitchen, of course). I have not heard about dia de los muertos before. Sounds like a good knees up! Day of All Souls, however, was a holiday in Germany when I was young. We would go out to collect moss and blue/green fir and make our graves up in lovely designs that included flowering Erica and Cyclamen. Candles were lit on all the graves and the priest would go around and eremoniously bless the graves. I could see the cemetary from my bedroom window. It would look such a picture at night and so pieceful. Your pottery looks amazing. First off, I’ve been out of town and not able to keep up with the comment section of my blog lately. Sorry about that as I love reading and responding to what you all have to say. I also want to add that this is my favorite part of blogging. I’m not into the numbers (how many hits, how many comments, etc.) — I’m into building community. I love this conversation and the wonderful people who add to it! Thank you to all of my bright, engaging, funny and inspiring friends! Yes, I’ve been taken with Dia de los Muertos for many years. Living in Taos, New Mexico many years ago got this obsession started! Thanks for the comment. The soup is indeed yummy! Spanish class? Oh, how fun! I know a little Spanish, but not enough to converse. I’ve been thinking of getting the Rosetta Stone version. Oh, Cid — you always make me laugh out LOUD. Snortingly so! Yes, you’re right about the flamenco dancer. But Fernandez was only medium hot and my vintage Spanish dancer princess dress deserved a flaming hot partner, so Fernandez has been replaced by Bravas hot and spicy. When you’ve decked yourself out in black and red lace, fans, flowers, embroidered shoes, and flamenco earrings, you need an equally expressive partner. A hot tamale of sorts. Fernandez wasn’t quite up to the heat level that Bravas brings to the dance floor. Oh, I almost forgot. Grated cheese does make for a wonderful topping and I’m sure you’re an expert as to what cheese goes with what soup. That will definitely be a plus when it comes to pairings in the soup kitchen. AOF — I wish I could have joined you as you definitely have the spirit of what I was trying to express. It’s about celebrating life and a life well-lived that has transcended our space and time. It’s all about respect and love. You obviously “get” that. I hope your day was special. You do know that if I suggested making sugar skulls they’d probably be made out of date sugar or maple syrup and that probably won’t work, so you’re safe for now. I almost always add a bit of hot chile powder to my green chile soups and stews. It adds nice color and flavor. I keep a package on hand and use it in all kinds of recipes. That started years ago when I lived in Taos. Your Mexican jambalaya actually sounds wonderful. It couldn’t be bad! I’ll be expecting the recipe on your blog soon. Since you are the Asian pepper expert, maybe we should do a joint blog post sometime. A pepper information post. I’ll do Mexican hot peppers and chiles and you do all the rest (since you’re the real chef). You know, that might be fun! What a great story! You’ve described it so perfectly that I’m able to see all aspects of it — from the graves to the little girl gazing out the window. Certainly a calm and peaceful scene. Thank you for sharing that. Your German version sounds very similar. People all over the world want to celebrate life and connect with departed loved ones. Celebrations of all kinds seem to revolve around food. Would love to hear about the soups you’ve created. I think you hit the nail squarely on the head there. No matter which continent or country, race or religion, food is always the common denominator. I really must time a trip back home to coincide with the end of Ramadan so I can show you some snaps of Manchester’s Southern Asian district in party mode. The streets are jammed with crazy revellers filling their faces, and not a drop of alcohol in sight! I’ve only heard of Dia de los Muertos in passing. Central/South American culture is still taking an age to gain prevalence over here. Really fascinating stuff, thank you! Right now I’m really hankering for a bowl of chicken and chilli soup! I’ve got no chucks in the larder but I’m making your recipe this week for sure. As a compromise I’m going to cook up a big batch of chilli beef and beans (an Anglicised version, at least) as soon as I’ve posted this comment, to keep in with your Mexican vibe. I look forward to your “Manchester Southern Asian district in party mode” blog post. Yes, food is such a great way to bring people together. There’s nothing like sharing meals we’ve prepared with love! And of course, the wine pairing that goes with it. I am sure my cuban heels, red and black flouncy skirt and accompanying hair ornaments will work perfect for The Soup Siren’s Brasserie. As for Red Hot Bravas, I’m not really keen on satin shirts unbuttoned to the waist (I’m more of a fleece, flannel and levis girl), but I will admit I do fall into that “dont’ get out much middle aged women” category. That’s if I make it past 100, anyway. Hmmm? I think I’ll have to move Jim Denevan to the top of your list. You know, I like those creative, artistic, brilliant, farmer types. Add the surfing or skiing and I’m totally smitten. You must write a book, dear friend! You are way too funny to keep all those thoughts of yours to yourself. I’m thinking you’ll have to pen the Siren’s cookbook, complete with companion stories for each recipe. Thank you for your kind words, old Girl. As requested, here are last week’s 4 soups. These came about on being inspired by the other professional channel that led me to live out of my store cupboard/fridge/freezer for a while. It certainly concentrated the mind wonderfully and is higly recommended. I made: Jamie’s storecupboard lentil soup (which was yummy), butternut squash and ginger soup, leek and potato soup, cauliflower soup a la Chef Miles. With yours and Cid’s approval they could kick start our soup kitchen :). I do have a cupboard full of different lentils (the tail-end of different bags), some butternut squash and even a few leeks and some Yukon gold potatoes. No cauliflower or ginger right now, but with your inspiration and a trip to Mile’s culinary education channel, I bet I could piece something together. It appears that today may develop into soup weather around here, so I appreciate your insights and ideas. Yes, let’s go for it (the soup kitchen). You know, if we were a little closer together, we could really do this. Of course between the 3 of us girls, maybe we wouldn’t have to work so hard at doing it. Plus, I’m sure we’d have some creative help from the rest of the gang (hopefully). Off to check out chef Miles’ soup ideas. 1 btsp. pumpkin seeds (toasted). Gently cook veg; add stock and cook for 20 mins. Blend in a liquidiser, then strain through a sieve. Serve with pumpkin seeds. I’ll pass on the lentil soup recipe, if you like. Re our Soup Kitchen. I am sure that it would work. Cid would provide wonderful cheeses and would dazzle customers in exotic outfits with mystery tales of the origins of the soups :). I’m going to make this Butternut Squash and Ginger soup today. I received 2 butternut squashes, a bunch of leeks and 2 good-sized onions in my CSA box last night (along with a bunch of other fall veggies). I need to get some ginger root, but I have everything else. Thank you so much for taking the time to write all this down. I may do a blog post on it soon. Who is M. Beazly? You know, between all our ethnic food interests, we (the girls) could have an amazing international soup kitchen. I know it would be a hit! Spell-binding ambience! I love that! Hope you will like the soup too. The ginger gives it that essential bite and warmth. M. Beazley is the publisher of the book “The simple art of marrying food and wine”. I do not pocess it. I merely wanted to attribute the recipe. It had been printed in The Times newspaper.